Will Vegans be banned or declared edible? A decision from the FDA and USDA will decide if Vegans should be banned or eaten. Further lab testing is required to determine their status. A final judgment should come down in about two weeks. The term Vegan was coined by an English gentleman in 1944. He was too weak to carry on the cause and died shortly after from a protein deficiency. 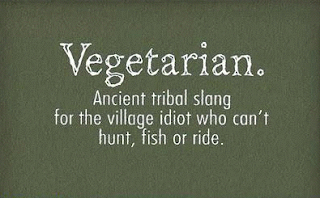 There is much confusion about people whose diet consists primarily of fruits, vegetables, bark, shrubberies, and Tofu. Vegetarians eat veggies and fruit. Vegans will not eat any animal based products. Ethical Vegans, the militant arm of the non-meat-eaters, will not use any commodities or food that comes from animals. They tend to be very arrogant, snooty and incredibly annoying. These are the ones that the FDA and USDA are studying closely. "What is the problem with Ethical Vegans?" "They're phonies. They say that they won't eat animal products, which is fine; but when they lash out against people for wearing or using products made from animals, they've stepped over the line." "Why do you say they are phonies?" "Face the facts. Unless they wear only rubber or cotton, they are going against their belief system." "Bzzzzt. Wrong. Polyester is made from oil. Oil came from decayed dinosaurs and other animals. That's why they're left with rubber or cotton. They can also use hemp, but it causes severe chaffing and rashes." "What other products should Ethical Vegans not use?" "How about soap. No wonder they look like retro-hippies and smell bad. Everything has animal products in it. If they only wear cotton shirts, pants or dresses and those ugly Crocs, they're OK. But everything else is out of their realm, if they want to be truthful about their mania." "Why, are there other things that cross the line for Ethical Vegans?" "Yeah, take a car seat. It's either leather or cloth made from petroleum products - which takes us back to abusing the dinosaurs." "So you're thinking about imposing a ban on Vegans?" "Yeah, if we can't slap some sense into them, we may have to ship them to Canada." "And what is the other alternative about declaring them edible?" "Vegans have a high-fiber diet full of high-nutrient fruits and vegetables. And the militant ones tend to eat exclusively Organic products. If we make Vegans edible, the average adult could get 45 servings of fruits and vegetables by consuming one Vegan. That is why the USDA is involved. They are the only ones that can declare a food product Organic." "Will there be testing specific to the Organic nature of Vegans?" "Yes, we'll have to make sure that they are second generation Vegans and have not grazed on any vegetables or fruits containing pesticides or chemical fertilizers for at least two years." "Sounds rather rigorous. I'm guessing quite a few won't make the cut." "Yup, and those suckers will be shipped off to Canada in a heartbeat. Aye.... ha...ha...ha...ha..."
So we all will wait to see if the FDA and USDA will decide if Vegans should be banned or eaten. I'm going to check with a taxidermist and see if we can mount them. yeah, the FDA spokesmen will talk like a three old child.